The South is famous for many iconic foods and biscuits are surely near the top of the list. Southern cooks have been baking light, flaky biscuits for generations and serve them for breakfast, lunch, and dinner. They can be buttered hot and served plain, or topped with sausage gravy, ham, or chicken. They're even used to make old-fashioned biscuit pudding dessert, breakfast casseroles, and stuffing or dressing. The good news is, you don't have to be a Southerner to make delicious biscuits, but there are a few technique tips to know. Soft wheat flour produces a higher and lighter biscuit than harder wheat flour, and many cooks swear by buttermilk, self-rising flour, shortening, and other "secrets." The real key, however, is in the handling of the dough. Once the dough is moist, work it just a few times, or only until it holds together. Pat the dough out or roll it lightly and cut it into rounds or squares. The biscuits you cut after you re-roll the scraps will be a bit denser, so keep them in a designated portion of the baking pan. These easy quick beer biscuits take no longer than 25 minutes from start to finish. The savory rounds are excellent with soups and stews or dipped into a hearty chili. The combination of two different flours gives these cornmeal buttermilk biscuits extra flavor and texture. Unsalted butter and buttermilk are among the ingredients and putting together the dough doesn't require a workout—the food processor handles most of the mixing. Bake a batch of the sweet apple cinnamon biscuits for an everyday breakfast treat or serve them as a sweet snack. Drizzle the vanilla glaze over the warm biscuits—already brimming with fall flavor—and enjoy! Pepper jack cheese biscuits are the perfect bread to serve with a big steaming bowl of taco or tortilla soups. Cayenne pepper adds a kick along with the cheese, but feel free to omit the pepper for less heat. Make a double batch and freeze some for another day. Duck fat has many uses since it has a fairly high smoke point. It's great for roasted and deep-fried vegetables, and it's even making a name for itself as a fat for baked goods. These duck fat biscuits are a prime example. You can easily go sweet or savory with sour cream biscuits, which pair wonderfully with syrup and jam, or topped with slivers of country ham or sausage gravy. Say hello to the classic Southern biscuit. These straightforward buttermilk biscuits contain a combination of butter, flour, and buttermilk to form a fluffy, light round. Cooked sausage, cheddar cheese, and herbs add to the savory goodness of these sausage cheddar biscuits. 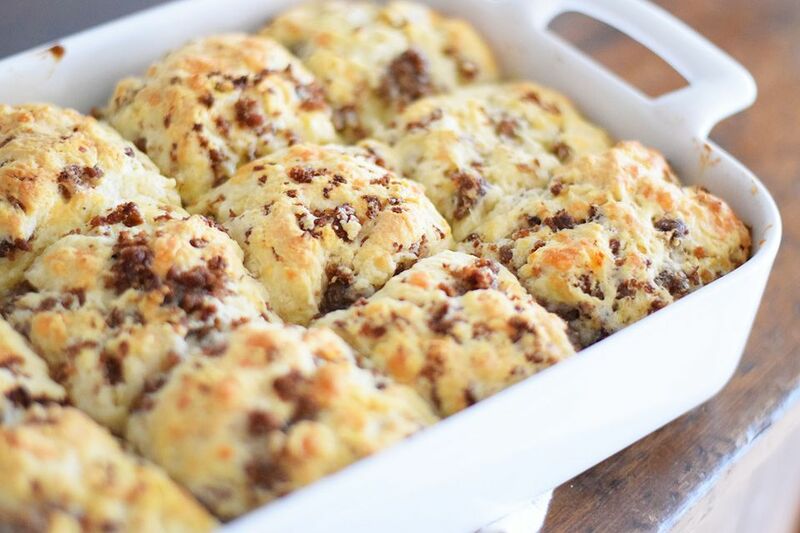 The biscuits are a little out-of-the-ordinary—in a good way!—because they are baked in a casserole dish. Prepare and freeze these easy make-ahead buttermilk biscuits and bake one or a dozen whenever you like. The savory pucks are made with butter and buttermilk, but add a tablespoon or two of sugar if you like them slightly sweet. The deep malty edge of Guinness stout shines in these Guinness and cheddar biscuits. Serve them with a hearty beef or lamb stew. Feel free to substitute a lighter beer or ale in the recipe. We recommend serving these Caramelized onion biscuits with a cream cheese spread, a fruit chutney or pepper jelly. On the savory side, they also make fabulous chicken or ham sandwiches. Cut them extra-small for bite-sized appetizer biscuits. Some dry yeast makes this recipe extra light and airy, hence the name, "angel biscuits." Serve them with your favorite breakfast spread or make sandwiches with them. Slices of ham, bits of fried chicken, or pulled pork are all excellent filling options. Two complementary flavors team up to form these savory cream cheese and chive biscuits. The biscuits are perfect for a special brunch or lunch. Split them and fill them with egg salad for a tasty bite. Bake these scrumptious cranberry walnut biscuits to serve along with a holiday brunch, or use them to make leftover turkey or ham sandwiches. Fresh cranberries and walnuts (or pecans) add color, flavor, and texture. These whole wheat biscuits with green onion call for some whole wheat flour, making them more fiber-rich than the usual kind. Chopped green onions and fresh parsley add flavor and texture to the biscuits. Here's yet another tasty way to use pumpkin pureé—in savory pumpkin biscuits! A small amount of brown sugar and a dash of cayenne help deepen the pumpkin flavor and add a zippy kick. These brown butter and sage biscuits have an extra nutty flavor. The combination of herbs makes them an excellent choice for Thanksgiving dinner or the leftovers. 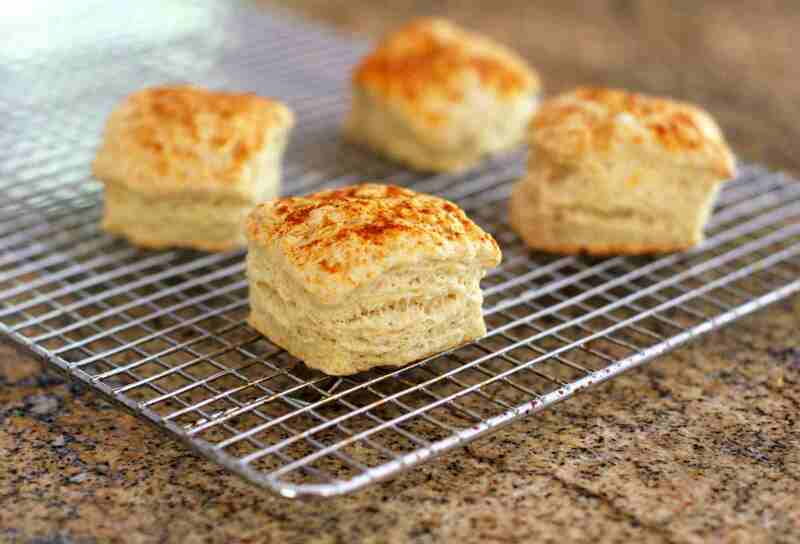 The heavy cream provides the fat in these rich easy cream biscuits. All you need is five simple ingredients and a bit of melted butter for the golden-brown tops. Honey butter biscuits are what your breakfast sandwiches have been missing—just stuff them with some creamy gravy and sausage or bacon. These sweet potato biscuits have a subtle sweetness. Brown sugar, a bit of cinnamon and allspice make them a delicious breakfast biscuit, but feel free to cut back on the sugar and spices for a more savory version.